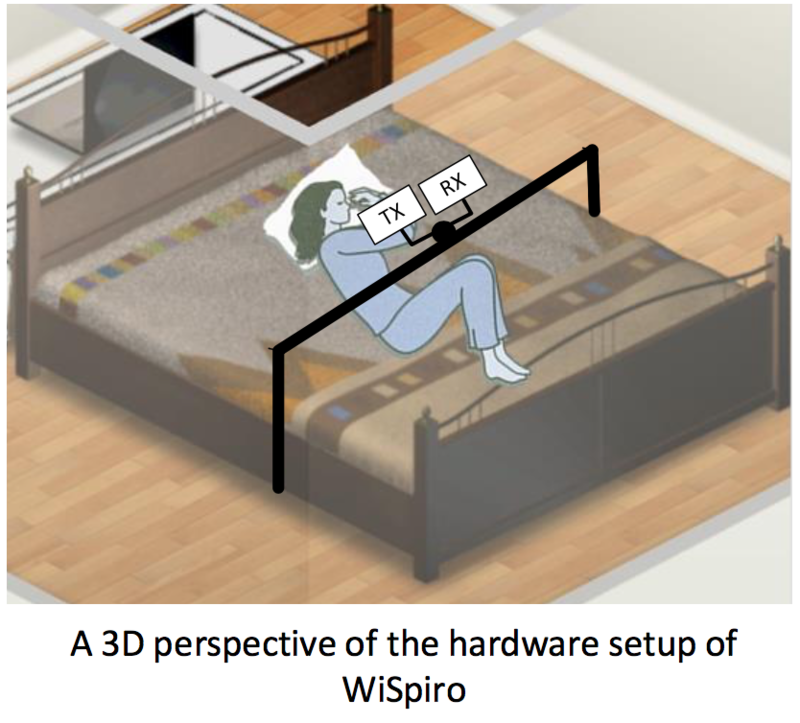 In this project, we propose for the first time an autonomous system, called WiSpiro, that continuously monitors a person’s breathing volume with high resolution during sleep from afar. 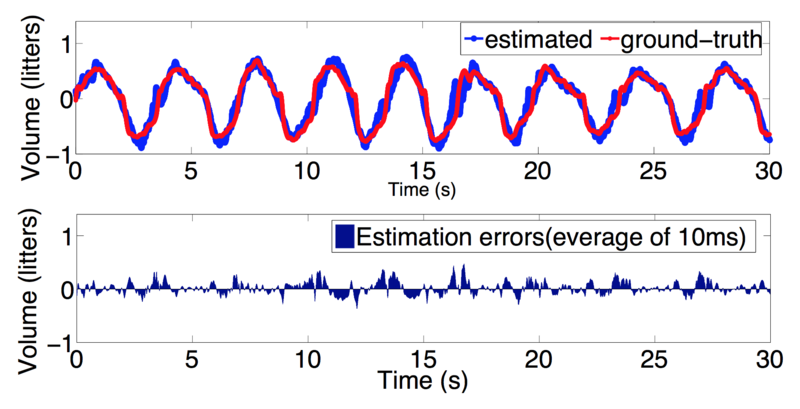 WiSpiro relies on a phase-motion demodulation algorithm that reconstructs minute chest and abdominal movements by analyzing the subtle phase changes that the movements cause to the continuous wave signal sent by a 2.4 GHz directional radio. 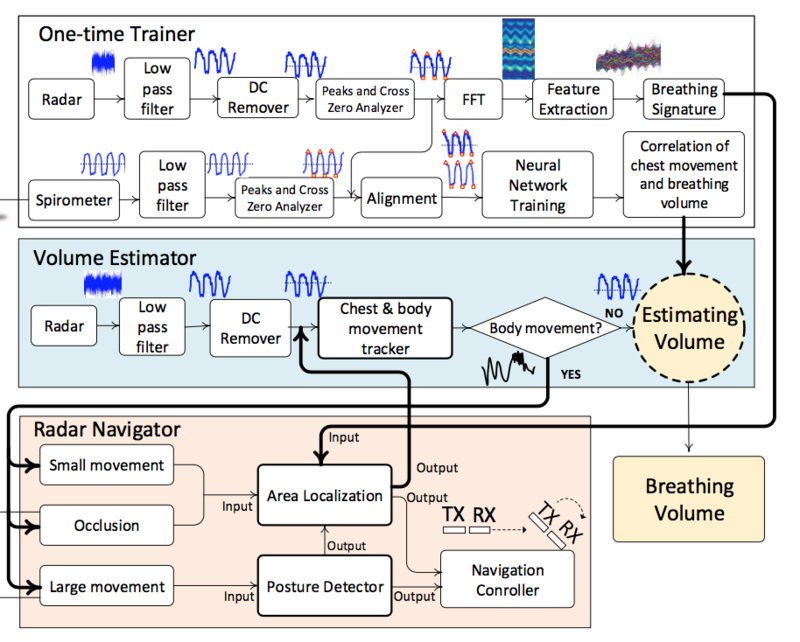 These movements are mapped to breathing volume, where the mapping relationship is obtained via a short training process. To cope with body movement, the system tracks the large-scale movements and posture changes of the person, and moves its transmitting antenna accordingly to a proper location in order to maintain its beam to specific areas on the frontal part of the person’s body. 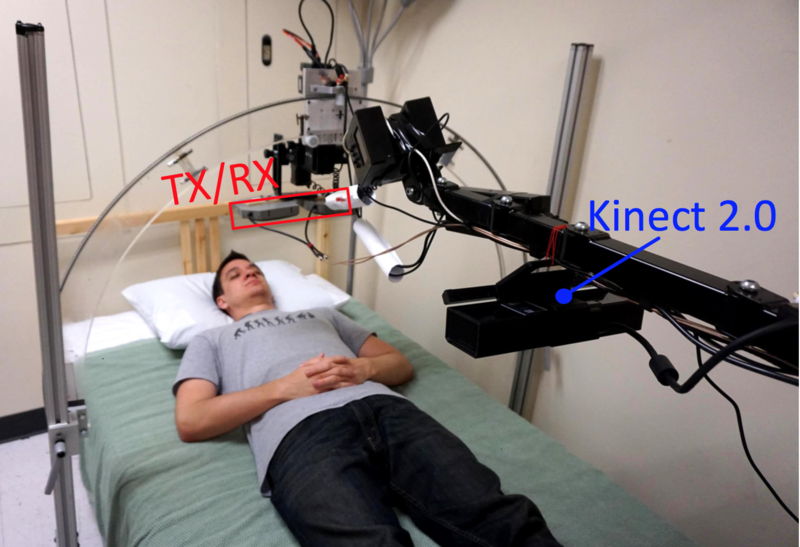 It also incorporates interpolation mechanisms to account for possible inaccuracy of our posture detection technique and the minor movement of the person’s body. We have built WiSpiro prototype, and demonstrated through a user study that it can accurately and continuously monitor user’s breathing volume with a median accuracy from 90% to 95.4% (or 0.058l to 0.11l of error) to even in the presence of body movement. The monitoring granularity and accuracy are sufficiently high to be useful for diagnosis by clinical doctor. ATS International Conference 2017 - The American Thoracic Society International Conference, Washington DC, USA, May 2017. ACM MobiCom-S3 2016 - The ACM International Conference on Mobile Computing and Networking. Wireless of the Students, by the Students, and for the Students Workshop, NewYork, USA, October 2016. IEEE INFOCOM 2016 - The IEEE International Conference on Computer Communications, San Francisco, CA, USA, April 2016. (300 out of 1644 submissions, acceptance ratio: 18.25%). ACM MobiCom 2015 (Poster Section) - The ACM Annual International Conference on Mobile Computing and Networking, Paris, France, July 2015.